News » Day 8 & 9 Highway To Mexico Update From CEO Stephen Woodburn! “The last 2 days we had off so we toured around and stayed close to our hotel and checked things out locally. Today is not over yet. It’s been an extremely busy and long day. It started out with the parade. It wasn’t “really” a parade but more so we drove our ambulances and fire trucks through the city core making lots of noise to gather some positive attention! It worked. We ended up at city hall and participated with several speeches in council chambers followed by a key ceremony. It was really interesting to see so many interested and appreciative people. We went for a wonderful Mexican lunch (long one) this afternoon. It was excellent. After that we did 2 more formalized key ceremonies. One was for a club or workers union who received a bus. They will use it for taking their people to and from work, funerals and several other events. 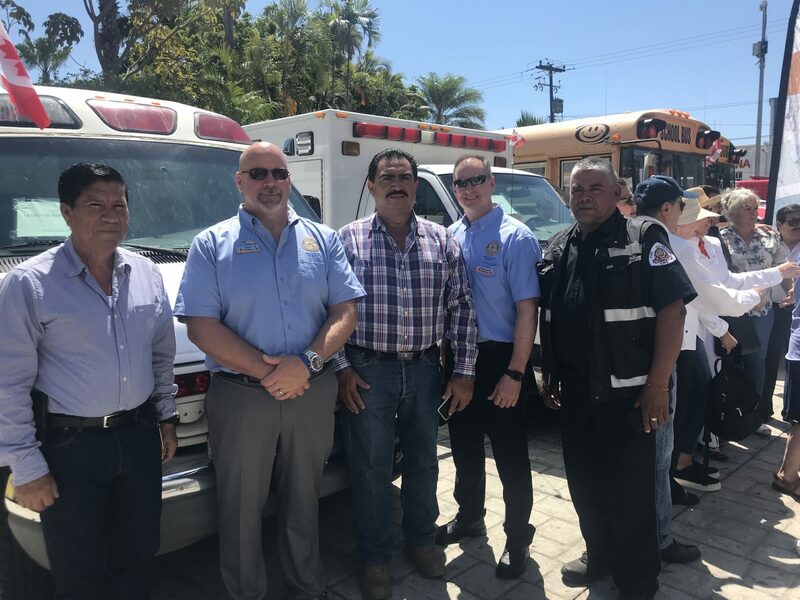 The second delivery was an ambulance for a suburb of Mazatlan. We had the pleasure of meeting several. paramedics that will be using it. They were very appreciative! It was a full day of several speeches from professionals, dignitaries as well as our own people.